10 April 2014 - Nashville, Tenn - Capitol CMG Label Group is proud to announce they have garnered nine 2014 Billboard Music Award nominations, which were announced live yesterday on "Good Morning America." 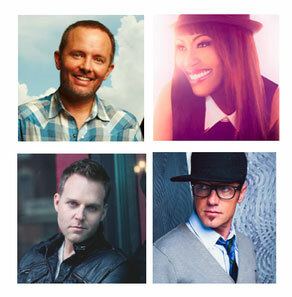 Chris Tomlin received three nominations, Mandisa and Matthew West each received two nominations, while TobyMac and WOW 2014 were also recognized. "We are so proud of our artists who were nominated for a Billboard Music Award and for being recognized for such an outstanding year," says Peter York, President, Capitol CMG Label Group. "We congratulate our Capitol CMG artists and all of their fellow nominees." The Billboard Music Awards finalists are based on key fan interactions with music, including album and digital singles sales, radio airplay, touring, streaming and social interactions on Facebook, Twitter, YouTube, VEVO, Spotify as well as other online destinations for music. The awards are based on the reporting period of March 11, 2013 through March 9, 2014. The 2014 Billboard Music Awards will be held live on May 18, 2014 from the MGM Grand in Las Vegas, airing on ABC at 8pm ET / 7pm CT. The complete list of nominees can be found at www.billboard.com/bbma/finalists. About Capitol Christian Music Group: Capitol Christian Music Group is the world's leading Christian Music company and market leader in recorded music, music publishing, and distribution. Part of Universal Music's Capitol Music Group, led by Chairman and CEO Steve Barnett, Capitol Christian Music Group operates several divisions including Capitol CMG Label Group (Sparrow Records, ForeFront Records, Credential Recordings, sixstepsrecords, Hillsong), Motown Gospel (in partnership with Motown Records), Capitol CMG Publishing (including Brentwood-Benson Music Publications) and Capitol Christian Distribution. CCMG owned labels are home to artists Chris Tomlin, TobyMac, Jeremy Camp, Hillsong United, Smokie Norful, Tye Tribbett, Britt Nicole, Newsboys, Matt Redman, Colton Dixon, Mandisa, VaShawn Mitchell and many others. Capitol CMG Publishing, in addition to publishing most of the CCMG labels' premier artist/writers, represents many of the leading writers in Christian/Gospel including Ben Glover, Matt Maher, Kirk Franklin, Mark Hall, Chris Stevens, Laura Story, Aaron Lindsey, David Garcia and many more. Key Distribution partners include The Gaither Music Group, Marantha Music, InPop Records, Worthy Book Publishing and Gaiam Vivendi Entertainment. Led by President and CEO Bill Hearn and a strong executive team of long-time Christian and Gospel music veterans, Capitol Christian Music Group is characterized by a passionate commitment to our artists, songwriters, customers, business partners, and one another, as well as a strong spirit of community service.